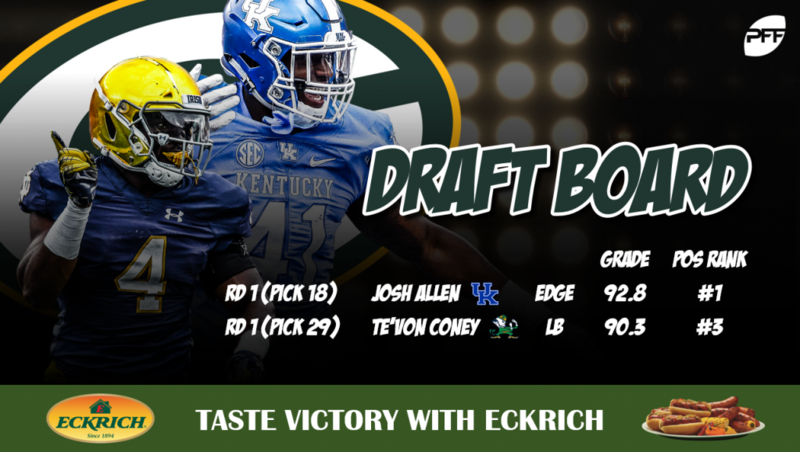 Kentucky edge defender Josh Allen and Notre Dame linebacker Te’von Coney take their talents to the Badger State in PFF’s Mock Draft 2. Senior Analyst Steve Palazzolo sends the two superstar defenders to the Green Bay Packers as the heir apparent to Clay Matthews and a running mate for stud linebacker Blake Martinez. The PFF 2019 NFL Mock Draft series is brought to you by Eckrich, the Official Smoked Sausage of the College Football Playoff. Allen leads all FBS edge defenders in overall grade (92.7) and pass-rush grade (94.3), recording 41 total pressures (24 hurries, seven quarterback hits and 10 sacks) and 32 defensive stops in the process. Rushing the passer, Allen leads FBS edge defenders with 150 pass-rush snaps in win rate (28.4) and pressure percentage (24.3%). The 6-foot-5, 260-pound Allen also adds value in the passing game in other ways, as a versatile coverage defender. His 79.0 coverage grade ranks sixth among the 50 FBS edge defenders who have dropped into coverage at least 40 times this season. And while he ranks second among the group in total targets (16), Allen has allowed just 10 receptions for 99 yards, zero touchdowns and only four first downs when targeted as the primary coverage defender. He’s also forced incompletions on 25% of his targets, which ranks third among qualifiers all while missing just one tackle in coverage. Proving formidable in all phases of the game, Allen is no slouch against the run, as he’s logged the fourth-highest run-defense grade (87.0) and 19 run stops. Allen fills a pressing need within the Packers’ front seven. None of the team’s five edge defenders this season rank inside the top-70 in overall grade through Week 8, with Reggie Gilbert leading the way at 64.3. In fact, the once-dominant Matthews ranks just 105th among the 118 qualifiers in overall grade (55.2) on the season. Martinez, unlike Matthews, has proven dominant as a leaned-on starter in the Packers’ defense, as he ranks seventh in overall grade (80.5) and, more importantly, third in coverage grade (84.5). The drop-off from Martinez to Green Bay’s depth linebackers, especially with Jake Ryan on the Injured Reserve, is notably bad. Green Bay’s second- and third-stringers at off-ball linebacker, Oren Burks and Antonio Morrison, have each earned sub-50.0 overall grades so far this season. Enter Coney who, among the 282 FBS off-ball linebackers with 300-plus defensive snaps this season, ranks first in overall grade (91.5), fifth in run-defense grade and third in coverage grade (90.8). In coverage, Coney has allowed receptions on just 9-of-21 targets as the primary coverage defender, leading to just 45 yards, three first downs and an interception. He ranks third in yards allowed per coverage snap (0.17) and second in passer rating allowed (30.5) among FBS linebackers with 200 coverage snaps so far this season. Coney and Allen would both serve as immediate upgrades over current veterans in Green Bay, adding to an ongoing youth movement (i.e. Josh Jackson, Jaire Alexander) on the defensive side of the ball for the Packers.